Traffic congestion has been an issue in California for decades. However, there may finally be light at the end of the tunnel for Golden State commuters. After more than four decades of proposals and controversies, the California High-Speed Rail project is underway. Photo courtesy of California High-Speed Rail Authority. First proposed in the 1970s, the high-speed rail system will stretch 800 miles from Sacramento to Los Angeles. Construction began in 2017, making it the nation’s first high-speed rail project and its largest public infrastructure project ever. Phase 1 is currently underway and covers 32 miles of the proposed rail line, beginning in the southern portion of Fresno County, running into Madera County and ending at Avenue 17, according to the California High-Speed Rail Authority (HSR). Design work on the first phase began in July 2015, with completion scheduled for August 2019. To ensure a timely, high-quality installation, the project will incorporate many precast concrete products. Steven Milton, an HSR design and construction manager, indicated the project had 14 construction sites underway at press time. Given the amount of ground the project has to cover in a relatively short span of time, precast concrete has been critical to maintaining a tight and continuous design and construction schedule. In fact, the rail line is being designed and built simultaneously with joint venture firm Tutor Perini/Zachry/Parsons (TPZP) serving as the design-build team for Phase 1. 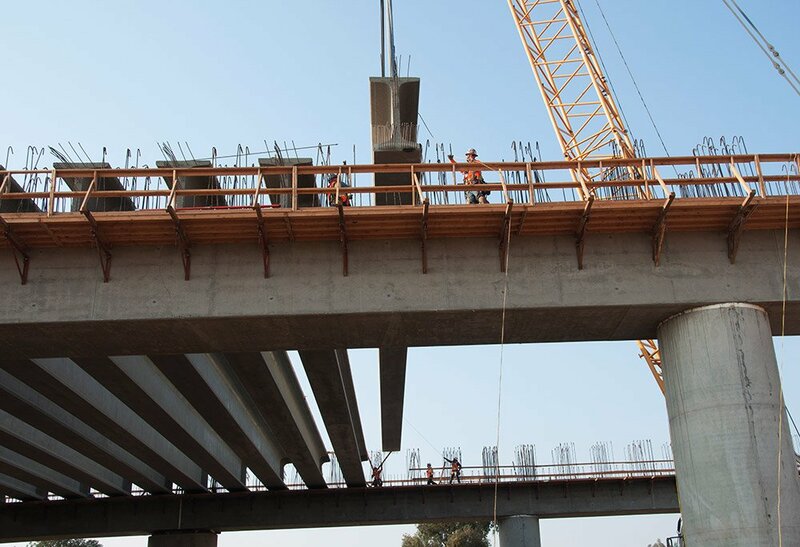 Precast concrete is being used in many ways, including bridge girders, deck panels for bridges, beams for the pergola that will span the Union Pacific Railroad track and San Joaquin River, embankment supports, struts in trench sections, storm drains and water drains. Joint venture firm Tutor Perini/Zachry/Parsons selected precast concrete to save time and increase efficiency on the California High-Speed Rail project. Photo courtesy of California High-Speed Rail Authority. According to Brent Koch, chief engineer for Con-Fab California LLC, Con-Fab is manufacturing concrete bridge girders and partial-depth, stay-in-place deck panels for approximately 40 different structures on the project. The girder style is the California wide-flange – a new shape the state adopted in 2011. The pergola, which includes the largest precast pieces on the project, is part of the San Joaquin River viaduct. It’s a bulb-tee and includes 198 girders. Milton said the team has benefited from the repetition of shapes on the project, noting that there are more than 700 girders but only 13 shapes. According to Vallejos, the precast girders vary in length from 48 to 177 feet. Meanwhile, the prestressed beams spanning the Union Pacific tracks are about 200 feet long and 160,000 pounds each. There are 196 of them in this phase. Koch said all the precast components Con-Fab is manufacturing are fabricated using steel formwork. The same forms can be employed for all the wide flange girders. Project precaster Con-Fab California is manufacturing more than 2,000 precast concrete components for the HSR project. Photo courtesy of California High-Speed Rail Authority. Meanwhile, 3.5-inch-thick precast concrete panels form the lower half of the bridge deck. According to Koch, there are approximately 100 deck panels for every bridge. In all, Con-Fab is manufacturing more than 2,000 precast concrete components for the HSR project. The biggest precast piece is the girder for Avenue 9, which is 177 feet long, 7 feet, 6 inches deep and weighs about 210,000 pounds. With the repetition of the forms and the ability to build components in the plant at the same time work is progressing in the field, the design-build team is able to increase project speed and efficiency. With the use of precast products, the high-speed train will run up to 220 mph when completed. Photo courtesy of California High-Speed Rail Authority. Reeve Trucking Company Inc., based in Stockton, delivers the precast components to the construction sites. Con-Fab collaborates with TPZP as well as Caltrans and Union Pacific Railroad where necessary to plan transport routes pre-delivery. “We have to make sure we have proper access to get off the highway and onto the job site,” he said. Vallejos agreed, noting the design-build team hasn’t faced any significant hurdles with the HSR project. Koch agreed, explaining that the production work has been without difficulty to date. While Con-Fab has been building bridges in California since the 1980s, he said the HSR project represents the most casting the firm has done for a single project. Koch also added that it has been difficult keeping up with changing priorities and schedules at times, but noted communication has been key. The high-speed train – which will run up to 220 mph – will begin accepting passengers as early as 2025. When the project is completed in its entirety, it will take passengers from San Francisco to LA (approximately 400 miles) in as little as 2 hours and 40 minutes. It looks like a very interesting and aggressive project. Let’s see if we can meet the deadline for completion schedule. I have been approached to provide the precast shop dwgs for the S. Fresno to Bakersfield segment. I will make my determination once I receive the complete and final design dwgs.